Thyme comes in all shapes, sizes and colors; perfect for that small scale ground covering plant, or as a thyme lawn, or draping over a rock wall to soften and age it, Thymus has been used for centuries to add charm and romance to gardens. With its diminutive size, brilliantly colored flowers that attract bees and other pollinators, and its ability to withstand drought and really challenging conditions its popularity is really not surprising. All thyme varieties and species on this list are hardy to at least Zone 5a on the Canadian Plant Hardiness Zone Map, and 4a on the USDA Map. Do you like funny sayings about thyme? Check out the signs of the thymes - I collect puns and funny sayings from all over and paint them on my rustic barnboard signs. 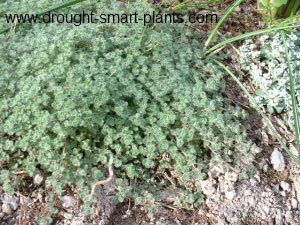 Thymus albus is the white creeping thyme. 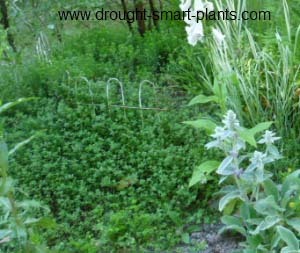 With pale lime green foliage and tons of white blooms in early July, it's a good foil for many other plants and forms a thick ground cover below other perennial plants. 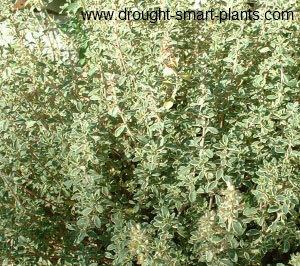 Thymus argentea, or silver thyme has green and pale silver variegated foliage on a shrubby little bush. 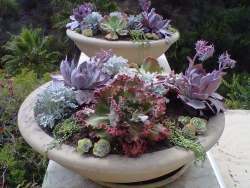 It's a great accent against plants with darker foliage. Grow it as a hedge around a potager or knot garden, or in miniature landscapes as a shrub. Thymus 'Bressingham Pink' is one of my all time faves. Lovely pale green abundant foliage completely covered by pink blooms in July make this a winner. Bees and other beneficial insects and pollinators flock to this plant when it blooms. Thymus coccineus, the red creeping thyme, is probably one of the most well known of all the thymes. Magenta coloured blooms hover over a delicate very low-growing and well behaved but extremely tough plant. 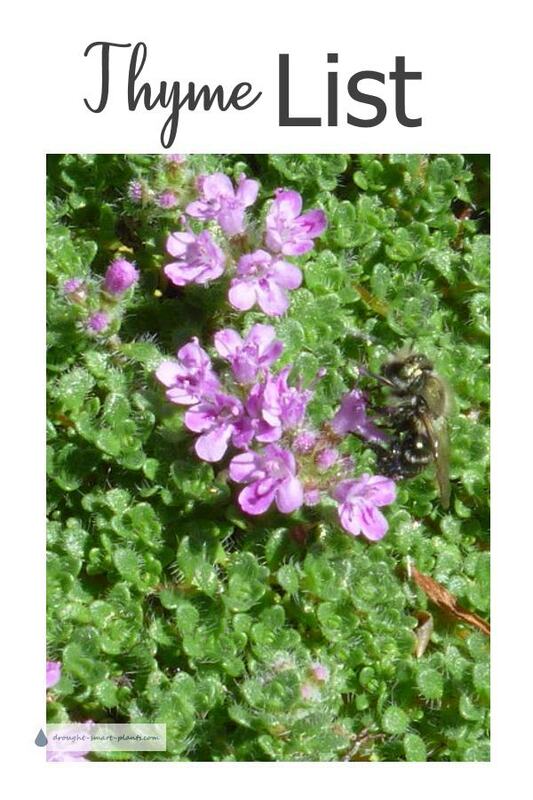 Excellent for a thyme lawn or planted among stone pavers or flagstones. 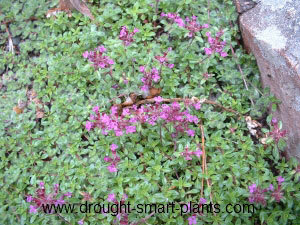 Thymus 'Doone Valley' foliage is dappled in dark green and bright gold, topped with pale pink blooms late in the summer. Loose yet lush growth habit make this one best for rockery planting, rather than lawns. Very pretty pale pink flowers in late summer provide late nectar for many insects. A bonus is the gorgeous red colour once the weather turns cold in fall. 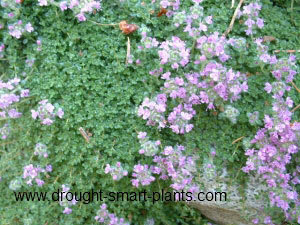 Thymus serpyllum 'Elfin' - THE most popular is Elfin thyme - and the most compact. Lovely, pale lilac blooms are a major pollinator attractant and can almost completely smother the plant. 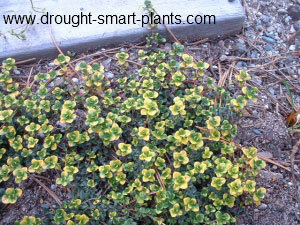 This is hands down the most best variety for thyme lawns and patio plantings, and for good reason. It's the top of my list. 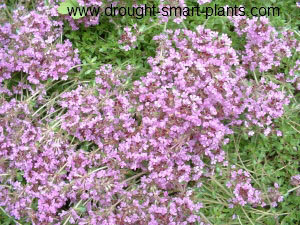 Thymus praecox, or mother-of-thyme is a loose billowing ground cover. Keep it trimmed to prevent bald spots and keep it compact. 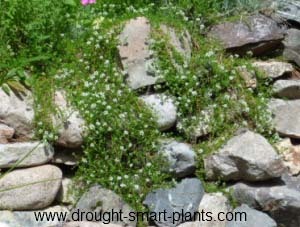 This species is not recommended for walking on as it's about 10cm tall and quite loose in growth habit, but it's great for flowing off a rock wall to soften the hardscape with its glossy dark green leaves. Thymus pseudolanuginosus, the Wooly Thyme - the prettiest of the low creeping thyme with its soft pale blue green foliage. I've only ever seen it in bloom once; it's nowhere near as prolific with the flowers as other varieties.